The thyroid gland is often referred to as the body’s “master controller,” as it is responsible for regulating nearly every major metabolic function in the body. It controls metabolic rate, the building of new proteins, sensitivity to other hormones, and much more. The thyroid gland produces hormones that are responsible for a wide range of functions and have connections with virtually every other system and organ in the body. In fact, every cell in the body has receptors for thyroid hormone. Perhaps the most important function of the thyroid is its responsibility to set the body’s metabolic rate. It dictates how many calories you burn for every physiologic, metabolic, and physical task. In addition to being one of the master controllers of metabolism and calorie burning, the thyroid contributes to mental and emotional well being, influences cognitive function, and even impacts sexual desire and function. Simply put, the thyroid is not a gland to be taken lightly. For example, iodine is one of two fundamental building blocks of thyroid hormone, and minerals like iron, zinc, and selenium play key roles in helping the body convert inactive thyroid hormone (T4) into its active state (T3). A deficiency in any one of these minerals can result in reduced levels of metabolically active thyroid hormone. In addition to the key nutrients that support thyroid health, there is also a crucial connection between gut health and thyroid function. In fact, as early as the 1920s, doctors posited that gut dysbiosis impaired thyroid function.3 Imagine that; even though it seems probiotics and gut health have just recently gained the attention they deserve, the notion that the microbiome impacts thyroid has been around for nearly 100 years! While there are myriad ways that the gut may influence thyroid function, one interesting fact is that healthy gut bacteria aids in the conversion of the inactive form of thyroid hormone (T4) into its metabolically active form (T3). In fact, approximately 20% of the body’s T4 is converted to T3 in the digestive tract via an enzyme called intestinal sulfatase, which is produced by the healthy bacteria that reside in the gut. Another way that gut dysbiosis negatively affects thyroid function is through a compound called lipopolysaccharide (LPS), which is a component of the cell walls of the “bad” bacteria that reside in the gut.5 LPS is considered an endotoxin, and there are a number of potential negative health outcomes associated with excess levels of LPS, including detrimental effects on thyroid. Specifically, LPS has been shown to reduce levels of thyroid stimulating hormone (TSH), which communicates to the thyroid gland to produce thyroid hormone (T4). What’s more, LPS has been shown to reduce the activity of the enzymes responsible for converting T4 to T3, decreasing the amount of active thyroid hormone. But that’s not all. LPS also acts on receptor sites for thyroid hormone, reducing the activity of receptors and preventing uptake of thyroid hormone into the cells. With all of that in mind, gut health and the gut microbiome are of tremendous importance for optimal thyroid function. Gut dysbiosis, which refers to an unhealthy imbalance of bacteria in the gut flora characterized by excessive levels of “bad” bacteria and inadequate amounts of “good” bacteria, means you’ll have fewer healthy bacteria (which help with conversion) and excessive levels of the endotoxin LPS. The good news is that there are a number of foods that can help boost thyroid function, but before delving into them, it’s worth pointing out a handful of dietary and lifestyle factors that can negatively impact thyroid function. While it still masquerades as a “health food,” soy has been linked to a number of health concerns, including thyroid dysfunction. Soy contains estrogenic anti-thyroid compounds called isoflavones—which are natural pesticides that cause insects to become sterile—that can have a goitrogenic effect, disrupting the production of thyroid hormone by inhibiting thyroid uptake of iodine and reducing activity of the enzyme involved in thyroid hormone formation. While gluten may not be the devil that some make it out to be, several studies have found a strong connection to thyroid dysfunction and gluten intolerance, fortifying the connection to gut health. In one study published in the American Journal of Gastroenterology, researchers found that gluten intolerant participants who followed a gluten-free diet for one year improved thyroid function. That’s right, avoidance of gluten may single-handedly boost thyroid function in some folks. The research from Dr. Alessio Fasano, one of the world’s leading researchers and experts in the area of gluten sensitivity, has also shown that gluten contributes to intestinal permeability, more commonly known as “leaky gut”; in fact, Dr. Fasano’s work has shown that, after gluten exposure, intestinal permeability increases in all individuals—not just those with gluten sensitivity. Gluten is one of the most potent stimuli that can trigger the body to release a protein called zonulin, which “loosens” the normally “tight” junctions of the cells that line the intestinal tract. This increase in intestinal permeability can lead to undigested proteins entering the blood stream, triggering an immune response from the body that may be associated with thyroid dysfunction. Again, this is not to say that everyone has to avoid gluten-containing foods or other plant-based foods with similar hard-to-digest proteins (e.g., prolamins, glycoproteins). However, this is something to consider for folks who may be having difficulty optimizing thyroid function. While soy and gluten may be two common offenders, the fact of the matter is that any food sensitivity could potentially contribute to thyroid dysfunction through activation of the immune system and unhealthy levels of inflammation. While not everyone has food sensitivities, there are some probable suspects, including grains (e.g., wheat), soy, dairy, shellfish, FODMAP-containing foods, nightshades, and histamine-containing foods. As mentioned above, this does not mean that everyone needs to avoid these foods. Rather, this is simply meant to raise awareness that a variety of foods—even foods that are frequently viewed as healthy—may be an issue for some folks. While consuming a diet of whole, minimally-processed foods is a huge step in the right direction, a more personalized approach may be necessary for some people, and that involves identifying and eliminating suspect foods. When it comes to artificial sweeteners, what good news have you heard about them recently? At a recent meeting of the American Association of Clinical Endocrinologists, researchers recommended that folks avoid artificial sweeteners to support thyroid health. They found that a group of individuals who regularly consumed the equivalent of 3 ½ packets of artificial sweeteners per day showed signs of impaired thyroid function. It may sound counter to your weight loss goals, but one surefire way to run your thyroid into the ground is by going on a crash diet, which includes very-low-calorie diets as well as certain “detoxes” and “cleanses.” These “quick fix” approaches, which involve dramatic calorie restriction, can reduce thyroid hormone levels by a whopping 66%. Additionally, stress can have a negative impact on thyroid health in a number of different ways. For example, stress hormones suppress thyroid function and prevent the release of thyroid stimulating hormone (TSH), which provides the signal to the thyroid gland to produce thyroid hormones. What’s more, stress hormones may also prevent the conversion of the inactive form of thyroid hormone (T4) to its metabolically active form (T3). Finally, before delving into a list of foods that can help support thyroid health and function, it’s important to remind you that if you are at risk for or being treated for a thyroid condition, please talk to your doctor before making any changes to your diet. deficiency is one of the leading causes of thyroid dysfunction. Approximately 40% of the world’s population is at risk for iodine deficiency. In fact, once researchers recognized this, health authorities began adding iodine to table salt (i.e., iodized salt). However, you don’t have to rely on fortified foods like iodized salt to support optimal levels of iodine. Sea vegetables, like kelp, nori, kombu, wakame, are the richest sources of iodine. With that being said, it’s important to be careful when it comes to iodine consumption; just as a deficiency can have negative consequences, too much can as well. Iodine can reduce the activity of an enzyme called thyroid peroxidase (TPO), which is required for proper thyroid production.24 What’s interesting to note is that excess iodine intake only seems to be problematic when it’s accompanied by too little selenium, another key micronutrient for thyroid health and function. As mentioned above, selenium is another key nutrient that plays a protective role in supporting thyroid function. Selenium concentration in the thyroid gland is higher than in any other organ in the body, and like iodine, selenium has important functions in thyroid hormone synthesis and metabolism. Selenium is essential for the conversion of the inactive form of thyroid hormone (T4) to the active form (T3), and research has shown a linear correlation between the T3/T4 ratio and selenium status.25 In other words, folks with lower concentrations of selenium have relatively lower levels of metabolically active thyroid hormone, and researchers have concluded that reduced conversion (of T4 to T3) is related to impaired selenium levels. In addition to offsetting potential negative consequences of excess iodine intake, studies also show that selenium reduces anti-thyroid antibodies.24,26,27 The presence of elevated levels of anti-thyroid antibodies often suggests thyroid dysfunction. Brazil nuts are more effective than supplements at raising blood levels of selenium. But Brazil nuts aren’t a one-trick pony, as they are also a good source of magnesium and copper, two additional thyroid support nutrients. That being said, it’s important to not go “nuts” on Brazil nuts. According to the Instituteof Medicine, the tolerable upper intake level (UL) (i.e., the highest level of intake that is known to avoid toxicity) for selenium is 400μcg per day. On average, Brazil nuts have 544 mcg selenium per ounce, but studies indicate that the selenium content may vary widely depending on country of origin, cultivation methods, etc. With that in mind, a good starting point for most folks would be to consume 2 – 3 Brazil nuts per day. are vitamin D deficient or insufficient. The active form of vitamin D actually functions as a hormone, and along those lines, vitamin D is much more than an essential vitamin: it’s a prohormone. Nearly every tissue in the body has a vitamin D receptor, including cells of the pancreas, immune system, skin, stomach, colon, and you guessed it, the thyroid gland. been linked to insufficient thyroid function. The body naturally produces vitamin D in the skin when it’s exposed to ultraviolet B (UVB) radiation from sunlight. This is why it’s so important to get plenty of sunshine. With that in mind, it’s crucial to ensure adequate vitamin D consumption through dietary and supplemental sources. The best dietary sources of vitamin D are fatty fish, especially wild salmon, which also happens to be a good source of iodine. What’s more, wild salmon contains omega-3 fats, which help support optimal thyroid function both directly (e.g., enhancement of thyroid action) and indirectly (e.g., promoting a healthy inflammatory response and enhancing immunity). Just like wild salmon, eggs are one of the few good dietary sources of vitamin D, but that’s not all. Eggs are a very good source of two more important nutrients for optimal thyroid function: selenium and iodine. Just three eggs provide 84% of recommended daily values for selenium, 54% for iodine, and 33% for vitamin D.
What’s more, when you choose pasture-raised eggs (which are laid by hens that get to spend their days outside on fresh pastures—not cooped up in small cages or huddled by the thousands in cage-free barns), you’ll get the added benefit of eggs higher in the same omega-3 fats found in wild salmon, which both directly and indirectly support thyroid function. Research from Mother Earth News demonstrated that eggs from pasture-raised hens provide a significantly improved nutrition profile compared to standard store-bought eggs, including 2 TIMES more omega-3 fatty acids. In the same series of studies, the researchers found that pasture-raised eggs contained SIX times more vitamin D than traditional eggs. Even more, while all eggs are a good source of vitamin A, pasture-raised eggs contain over 67% more compared to conventional eggs. Vitamin A has been shown to regulate thyroid hormone metabolism and promote healthy levels of thyroid-stimulating hormone (TSH), which, when produced in excess, can be a sign of thyroid dysfunction. In a randomized, double-blind, placebo-controlled study published in The Journal of the American College of Nutrition, researchers from Iran found that supplementation with vitamin A for 4 months normalized TSH levels and significantly increased T3 (the active thyroid hormone) in healthy normal weight and obese women. There’s still more, as eggs are a very good source of B12, and research has shown a strong link between B12 deficiency and inadequate thyroid function. In one study, researchers found that 58% of B12 deficient participants who were given B12 shots monthly noticed significant improvements in symptoms associated with thyroid dysfunction. You may have heard of eggs garnering the title of “the perfect food,” and there are a number of reasons why, including their potential to support optimal thyroid function. excellent source of copper and a good source of iron, and inadequate levels of both copper and iron have been linked to low concentrations of active thyroid hormone, T3. deficiency resulted in reduced T3, lower body temperatures, and elevated TSH in rats, suggesting that copper deficiency interferes with thyroid hormone metabolism. Iron also plays an intricate role in thyroid function, and deficiencies in iron impair the body’s ability to make thyroid hormone by reducing the activity of TPO (remember, that’s one of the enzymes required for optimal thyroid production). Randomized control trials have shown that providing iodine plus iron results in greater improvements in thyroid function than iodine alone, demonstrating the significance of adequate iron intake for optimal thyroid health. Sesame seeds are also a good source of zinc, which plays an important role in the conversion of the inactive form of thyroid hormone (T4) to T3, the metabolically active form. Just like selenium, deficiencies in zinc can slow down the body’s conversion. In fact, research has shown that zinc deficiency can decrease activity of the enzymes that convert T4 to T3 by as much as 67%.45 That could mean running on only one-third of your thyroid potential! thyroid health and thyroid hormone conversion. intake in just a half-cup serving. What’s more, pumpkin seeds are also a good source of both zinc and iron, providing 23% and 16% of the daily recommended intake, respectively, per half-cup. Pumpkin seeds are also a very good source of magnesium, providing 48% of the recommended daily intake in a half-cup serving. Magnesium, which is involved in over 300 enzymatic reactions in the body, joins minerals like copper and zinc in the conversion of the inactive form of thyroid hormone (T4) into its metabolically active form (T3). Research has shown that the conversion of T4 to T3 is inhibited by low levels of magnesium. What’s more, experimental studies have shown that diets deficient in magnesium are associated with “leaky gut” and gut dysbiosis. Are you starting to see a trend yet? What’s more, a 3-ounce serving of beef is also a good source of iron, providing 16% of the recommended daily value. While many foods in the diet contain iron, it is not always easily absorbed depending on the source. For instance, iron from plant-based foods (i.e., non-heme iron) is not well absorbed. On the other hand, heme iron, which is found in beef and other animal-based foods, is much more readily absorbed. Not only that, combining sources of heme iron with non-heme iron (e.g., beef plus veggies) increases the amount of non-heme iron absorbed. This is often referred to as the “meat factor” of iron absorption. Your best bet is to invest in the best beef that you are able to fit into your budget. In a recent systemic review and meta-analysis published in the British Journal of Nutrition, a group of researchers critically analyzed data from 67 different studies comparing the composition of organic (i.e., grass-fed, pasture-raised) and non-organic (i.e., conventional) meat products. They found that the beef from pasture-raised animals contained 47% more omega-3 fatty acids than conventional meat products. In addition to a much healthier omega-3 fatty acid profile, research also shows that grass-fed beef is one of the best dietary sources of conjugated linoleic acid (CLA), as it contains an average of 2 to 3 times more CLA than conventional beef. mass, and improve body composition. This is a good reminder that you are what you eat ate. It seems like the word “superfood” gets thrown around a lot, leading you to believe that there are single foods that can make or break your health and fitness goals. The truth is that there is no “magic bullet,” and deep health is the by-product of choosing high-quality, nutritious foods in appropriate amounts, creating a positive food environment, engaging in regular physical activity, practicing stress management, optimizing sleep hygiene and quality, adequately hydrating, and building and maintaining healthy relationships. Indeed, there are a number of “Big Rocks” that go into the jar of getting (and staying) lean and healthy, and certainly one of those is regularly and consistently eating wholesome and nutritious foods. So while the promise of superfoods may be a little far-fetched, the guidance to eat more nutrient dense foods is not, and when it comes to foods with a high nutrient density, spinach has got to be near the top of the list. As mentioned above, combining iron from animal sources (i.e., heme iron) with that from plant-based sources (i.e., non-heme iron) can increase the amount of non-heme iron that the body absorbs. In addition, vitamin C has also been shown to facilitate the absorption of non-heme iron by the body when the two are combined. Spinach is also an excellent source of vitamin C, providing 24% of the recommended daily intake in just a single cup of cooked spinach. It is worth noting that spinach contains goitrogens, which are naturally-occurring substances found in a variety of foods (including broccoli, cauliflower, kale, and other cruciferous vegetables) that may affect thyroid function by blocking the uptake of iodine by the thyroid gland or by interfering with the activity of TPO. Thus, excessive intake of goitrogens may potentially be problematic, particularly in folks who are iodine deficient. For otherwise healthy folks, however, this does not seem to pose an issue. When nutrient-dense foods like spinach are consumed in moderate quantities, they indeed support thyroid function, as spinach is such a dense source of so many nutrients that promote thyroid health. It may also be worth mentioning that goitrogenic substances are heat-sensitive, and they are inactivated by cooking. What’s more, shrimp are also a good source of omega-3 fats, which, as previously mentioned, have both a direct and indirect impact on thyroid function. Shrimp cocktail, anyone? Yes, please! If you needed any additional reasons to include these delicious foods in your diet, you can add thyroid support to the list! Besides sesame seeds, cashews are the next best whole food source of copper, providing 98% of the recommended intake in a quarter cup serving. Cashews are also a good source of both magnesium and zinc, providing 29% and 21% of the recommended daily intake, respectively, per quarter cup serving. Last on the list, but certainly not least, are fermented foods. As mentioned in the introduction, gut health and the gut microbiome can play a tremendous role in thyroid health, and gut dysbiosis (i.e., a lack of healthy bacteria) can have wide-ranging negative effects on thyroid function. This is why it’s very important to support gut and thyroid health by eating plenty of probiotic-rich foods, and three of the top options are kombucha tea, sauerkraut (and other fermented vegetables), and Greek yogurt (and other fermented dairy, like kefir). Kombucha tea is a great source of lactic acid bacteria (i.e., Lactobacillus probiotics), and so too are both Greek yogurt and sauerkraut. In addition, kombucha is a good source of vitamin B12, and research has shown that it has antibacterial and antioxidant activity, and it may also help support the immune system. In addition to being a great source of probiotics, Greek yogurt is also a very good source of two more thyroid support nutrients: iodine and vitamin B12. Greek yogurt also contains a unique protein called lactoferrin, which has immunity optimizing properties and anti-microbial activity. In one randomized double-blind, placebo-controlled trial, researchers found that athletes consuming lactoferrin-rich colostrum (i.e., milk) for two weeks significantly reduced intestinal permeability. When choosing Greek yogurt (and other dairy), it’s a good idea to opt for organic. In a recent systemic review and meta-analysis published in the British Journal of Nutrition, researchers reviewed the results of 170 published studies comparing the nutrient composition of organic (i.e., grass-fed, pasture-raised) to conventional (i.e., grain/ commodity-fed) dairy. Compared to conventional dairy, the researchers found that dairy from pasture-raised cows was 56% higher in omega-3 fats (EPA, DHA, DPA), which help promote a healthy inflammatory response and support thyroid health and function. What’s more, organic dairy contained 69% more conjugated linoleic acid, which, as previously mentioned, has been shown to preferentially modulate body composition, enhance immunity, and promote a healthy inflammatory response. In addition, fermented foods like these that provide beneficial bacteria (i.e., probiotics) support both gut and thyroid health by defending against gut dysbiosis and restoring the symbiosis (“mutually beneficial relationship between two different organisms living in close approximation”) between humans and gut microbes. In other words, humans have evolved intimate symbiotic relationships with gut microbes. In fact, human beings can be considered “superorganisms” as a result of their close symbiotic associations with the gut microbiota. Optimal human health and homeostasis revolves heavily on this symbiotic relationship, which entails maintaining a healthy balance of bacteria in the gut. Remember that compound LPS that was discussed in the introduction? As a brief refresher, LPS is an endotoxin released by the “bad” bacteria that reside in the gut, and it has been shown to reduce levels of thyroid stimulating hormone (TSH), reduce the activity of the enzymes responsible for converting T4 to T3, and reduce the activity of thyroid hormone receptors, preventing uptake of thyroid hormone into the cells. The good news is that a number of studies, including randomized control trials, have shown that probiotics significantly decrease LPS concentrations in the gut. There’s more good news. Research has also shown that probiotics, from both the Lactobacillus and Bifidobacterium families, help prevent intestinal permeability (i.e., “leaky gut”). Healthy gut bacteria also support thyroid function through the production of compounds called short-chain fatty acids (SFCA), which are produced when healthy microbes ferment indigestible fibers (i.e., prebiotic fibers). SFCA not only serve as fuel for the immune cells lining the gut, they also increase the expression of thyroid receptors. Remember, if you are at risk for or being treated for a thyroid condition, it’s important that you talk to your doctor before making any changes to your diet. The ketogenic diet is making waves in the diet world and for good reason. 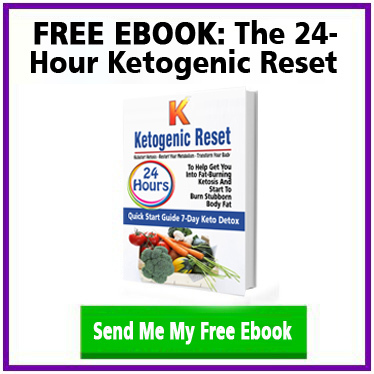 The ketogenic diet has been shown to help you lose weight fast, balance your hormones, and even reverse many diseases in our society. That’s why I created The Ketogenic30, a 30-day ketogenic diet challenge designed specifically to help you get into fat-burning ketosis fast and by not avoiding your favorite foods. Sure, you’ll have to make some changes, but it’s not as drastic as other keto diets that force you to count macros, calories, and carbs.